Welcome to Heaven. Well... Maybe. The NBC sitcom THE GOOD PLACE is set in the afterlife, where a somewhat bad girl finds herself accidentally sent to the "The Good Place" (instead of down below) – but only because she's been mistaken for someone else. The Good Place offers picture postcard villages, beautiful gardens and heavenly mansions. 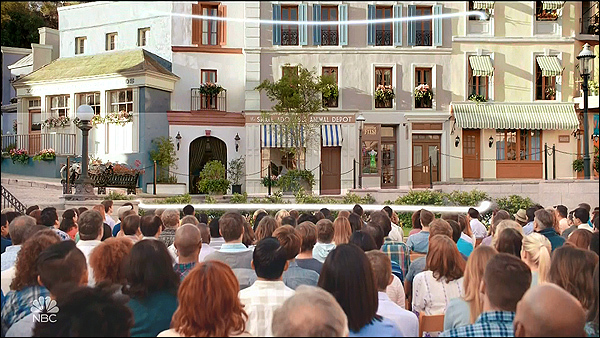 But in real life this TV version of heaven is a mix of several different locations, some real, some not. But you can still visit all of them. For these gorgeous locales, they went straight to one of the more heavenly places in Southern California: The Huntington Library, Art Collections, and Botanical Gardens, at 1151 Oxford Road, in San Marino, CA (right next to Pasadena). 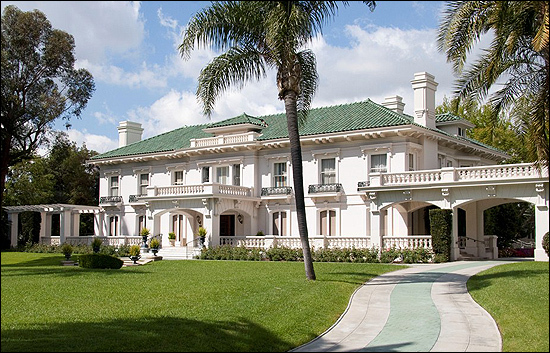 The Huntington (as it is known), is the former estate of Henry Huntington, a tycoon who was responsible for the original Red Car trolley system in Los Angeles (and after whom the city of Huntington Beach is named). And it is filled with gorgeous gardens, art galleries, and sweeping vistas. You can visit the Huntington to see it all for yourself. Normally, that will cost you $23 admission (as of 2017), but if you go on the first Thursday of every month, you can get in free (with advance tickets). Here is a Google Photosphere of that north vista. 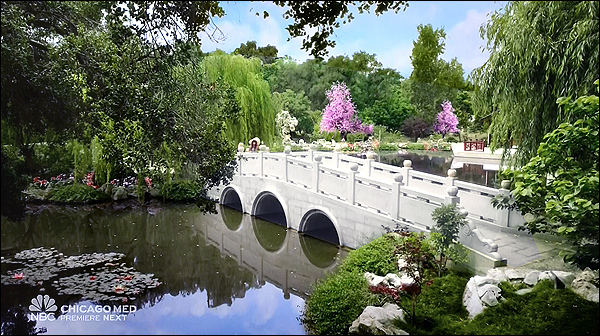 And here one of the Chinese garden. So, what about that pastel-hued, adorable little village? You may have driven right past this permanent outdoor set, without even knowing it - if (like may people) you've ever taken the Universal Studios Hollywood tram tour. But if so, I can't blame you for not recognizing it. Even though I've been to Universal many times, I had to study photos of their various back lot sets before I could finally figure out which one they used for this heavenly village. It turned out to be one of Universal's oldest outdoor sets: their "Old Europe" set, seen on their back lot studio tour, where they filmed Universal's classic B&W horror films like "Frankenstein" and "Dracula". Suffice it to say, most times, "Old Europe" is a far less colorful place. To turn it into The Good Place, they did some major redecorating of the old set. 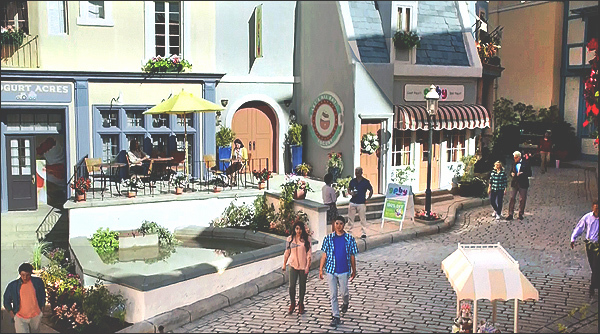 They repainted it in pastel colors, added flowers & trees, awnings & streetlamps, grass lawns and fountains, Willy Wonka-style columns, and other fairy tale touches, to give the location a much lighter, fantasy look. dwarfing Eleanor's cottage next door. 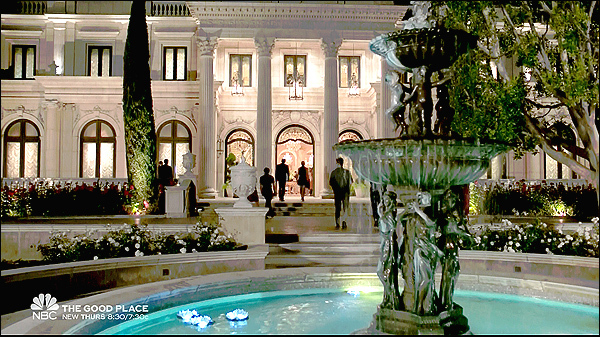 Here's a close-up of the entrance to her mansion, with party guests going in. 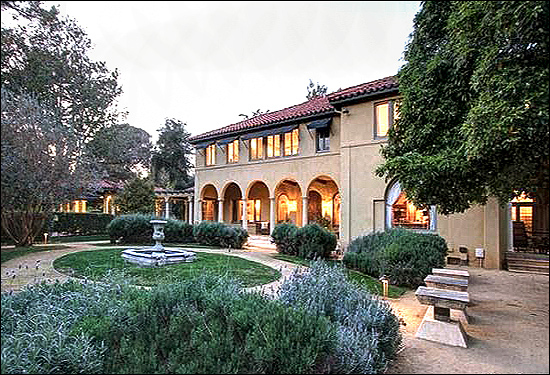 This is an actual mansion -- well, sort of. The close-up you see above is a pretty good shot of the actual mansion. 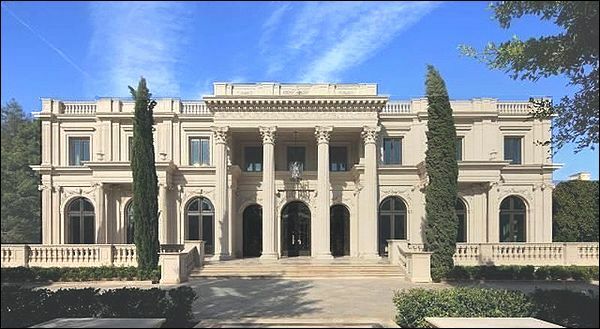 In real life, the mansion they used is very large - boasting 36,000 square feet, nine bedrooms and fourteen bathrooms, it's valued at around $50 million. But since this is a TV fantasy (and heaven, to boot), they weren't satisfied with large, they wanted insanely huge. 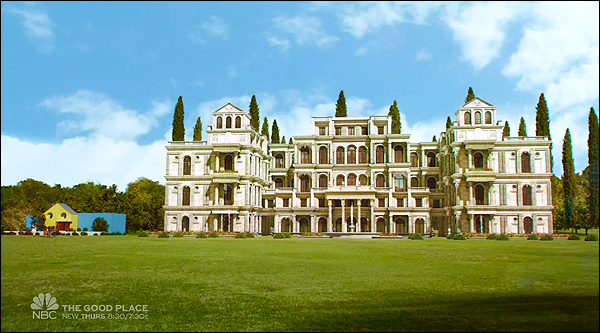 So what they did was to take that original mansion and then use PhotoShop (or some similar tool) to multiply it into a behemoth of a house, many times its actual size. 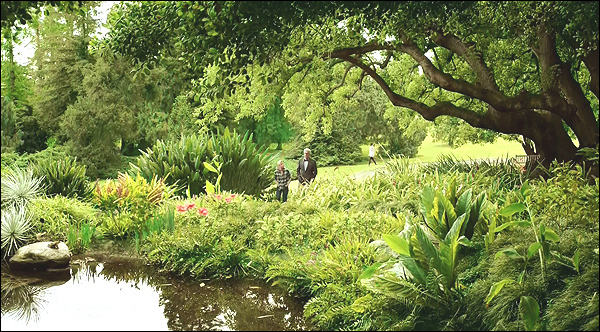 They then digitally inserted both houses on the Australian lawn at The Huntington. just a few blocks east of the Beverly Hills Hotel. Finally, remember that memorable scene in the pilot episode where Eleanor's sins caused The Good Place to go crazy, with giant lady bugs, and giraffes on Main Street? Well, that scene above was actually a CGI composite of several different places and things: The lawn appears to be the Australian lawn from The Huntington again. 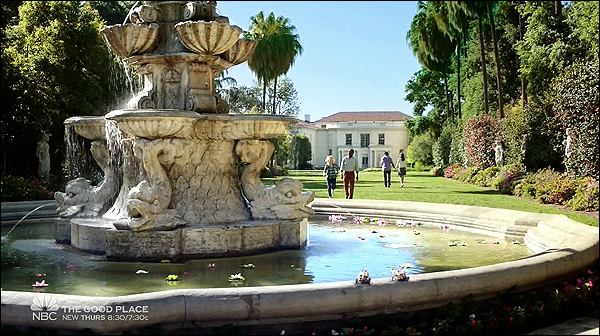 But the green-roofed mansion on the right is actually the Wrigley mansion, otherwise known as Tournament House, the former home of chewing gum magnate William Wrigley, and now the headquarters for the Tournament of Roses. You'll find it near the start of the Rose Parade route, at 395 S. Orange Grove Blvd, in Pasadena CA., which is about three miles northwest of the Huntington. Here is a Google StreetView of the mansion. Here is a Google Earth view of the mansion. 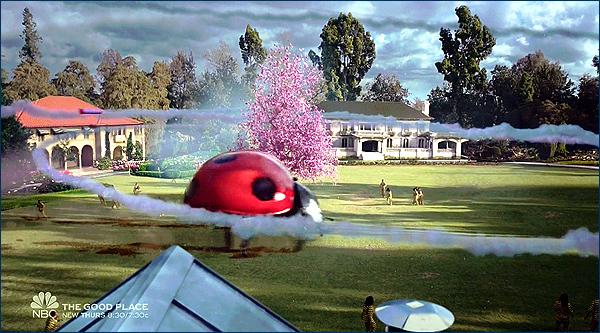 And, of course, the ladybug is pure CGI. For information about watching TV sitcoms being taped live in the studio, see the separate page about getting tickets to live TV tapings.